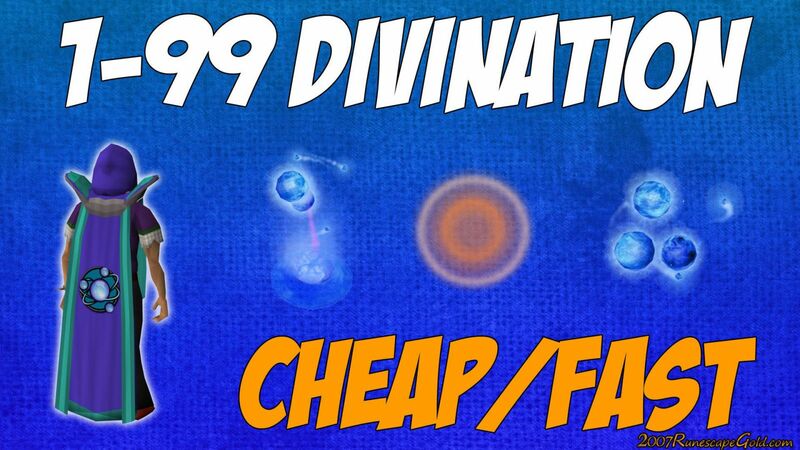 Today we are sharing with you some tips for that will help you get up to 99 Divination! But we also want to let you know about our low priced Runescape Gold that is on special offer right now! Please note that the idea of this guide is to let you know the kind of things you want to deal with in order to level up faster. More Runescape Divination Training Guide details. please check. Pale Wisps at Lumbridge Crater. It will take you around 20 minutes at the most to level up to 10. Flickering Wisps at the Falador Loadstone. Once again you are looking at about 20 minutes. Bright Wisps at East Of Varrock are what you will be wanting to do here. You are looking at around 40 to 50 minutes. You want to go South Of Seers Village as there is a lot of Glowing Wisps. These will take you up to 100 minutes to get up to level 40. Sparkling Wisps are what you are looking for here and you will find them, South Of Rellekka Lodestone. This will take you 2 to 3 hours. At the center of the Karamja Jungle are Gleaming Wisps. You are looking at anywhere from 4 to 6 hours to get to level 60. Vibrant Wisps can be found North of the Mobilising Armies and you are looking at 5 hours at the very most. This one is a little different as it requires you to do the Empty Throne Room which requires the Diggers Side Quest. It can take up to 14 hours, but it is the quickest way to get XP. You can do two different things for this XP. Lustrous Wisps at West Of Canifis. Or you can do Elder Wisps, but they require the Fate Of The Gods Quest. Brilliant Wisps at the East Of Mage Training Arena are what you are looking for. 18 to 23 hours is the average time. Head to Dragontooth island where there is a nice supply of Radiant Wisps. The Desert South Of Sophanem is full of Luminous Wisps. Getting to level 95 by utilizing these can take up to 52 hours! South West of Castle Wars are Incandescent Wisps and you are looking at 57 hours at the most to get all the way up to level 99.